Cycling is a great way for children and youth to exercise and lead a healthy lifestyle. Studies have shown that regular cycling increases cardiovascular fitness, improved posture and coordination, and decreased stress levels. Cycling has also changed urban landscapes, such as in Copenhagen, making them more sustainable, and even helps people improve their quality of life by increasing one’s confidence and self-esteem. Is Cycle for Youth Science just for kids? No, Cycle for Youth Science is open to everyone of all ages, with kids, youth, parents, family, friends and any adult all welcome to register for the event. Choose one of the five categories when registering: 1) Elementary school rider, 2) Middle school rider, 3) High school rider, 4) Remote rider (K-12), and 5) “Big Kid” Adult rider. 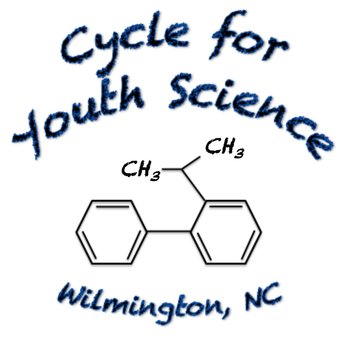 How can I register for Cycle for Youth Science? 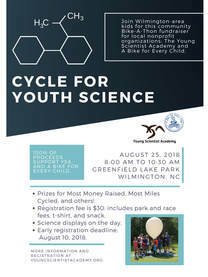 The easiest way to register for the main bike-a-thon event is online: https://www.youngscientistacademy.org/cys-registration.html Participants can also download the registration form here and mail printed copies to Cycle for Youth Science, 702 Paisley Ct., Wilmington, NC 28409. How much is registration and how can I pay? Early bird registration is $30 up until 10 August 2018. Participants can still register after this date for $40. We accept all credit cards, PayPal and check. If paying by check, we will invoice your registration within 1-2 business days. Do I have to live in Wilmington to participate in the Bike-a-thon? No, our event is open to everyone to participate. If you are not local to Wilmington, you can still participate by registering as a remote rider. I am not available on the Bike-a-thon day, can I still participate? Yes, absolutely. We have a remote "rider category" that can be completed anywhere, anytime before Saturday August 25. This way you can participate in this community event anywhere in the world and in your own time! If you do register as a remote rider please let Dr. Rob know so he can promote it on the website and social media. What is the Tour de Cape Fear corporate ride? Three days before the main Cycle for Youth Science Bike-a-thon at Greenfield Lake, Dr. Rob (YSA) and Kelly (A Bike for Every Child) will embark on a 120-mile ride throughout rural southeast NC to raise awareness of our programs in Pender, Duplin and Sampson county communities impacted by Hurricane Matthew. How can I sponsor the Cycle for Youth Science event? There are many ways to get involved with sponsoring our community event. Individuals can sponsor riders or provide registration by pledging any amount online. Even if you don’t know the riders, we will find a rider for you to support, all you need to do is pledge. Every little bit helps! Corporations and organizations can also provide sponsorship by pledging money at one of our corporate sponsorship levels or donating prizes (such as gift cards, equipment, in-kind services etc..), which will be awarded to our riders after the main event. How can I volunteer for Cycle for Youth Science? What will the funds raised by Cycle for Youth Science be used for? 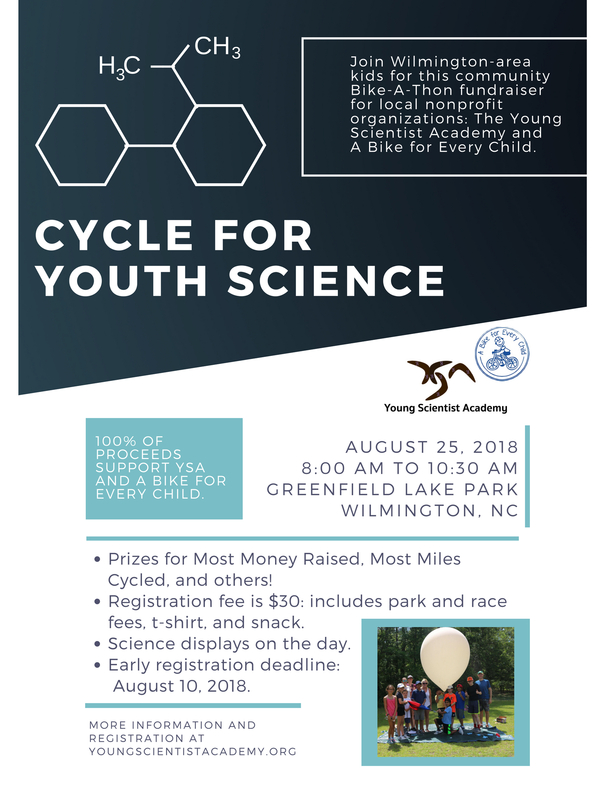 All funds raised by the “Cycle for Youth Science" program will kickstart our program in downtown Wilmington by providing children and youth interactive “think tank” research facilities and artistic space at the Jo Ann Carter Harrelson Center. How can I enroll my child in Young Scientist Academy programs?